My clinics are a combination of teaching both horsemanship ideals and technical skills to help riders truly connect with their horses. I want my students to understand how a horse thinks and how he feels on the inside, with better awareness of what’s important to the horse. Riders must remember that every reaction a horse has is triggered by his survival instincts. He is wired to act as if his life depends on it. I teach my riders to do simple exercises on the ground before they mount to connect with their horse and gain his trust and confidence. These exercises can then be applied once the rider is on their horse’s back and integrated into their ride, feeling the connection and connecting the feel. I focus on flatwork for the first part of each session to prepare the horses both physically and mentally for the jumping exercises. 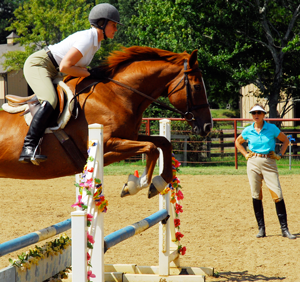 We may then work over poles on the ground or advance to gymnastics depending on the level of horse and rider. I will work on riding lines or complete courses focusing on precision and the horse’s willingness to adjust his stride in a calm and relaxed way. No matter what exercises we are working on, the horse’s well being is foremost in our thoughts. I am constantly aware of his inner peace and comfort and what I need to do to maximize his athletic ability without causing tension or concern.